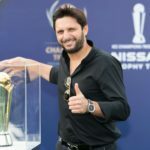 Eoin Morgan’s fractured finger has paved the way for Shahid Afridi to lead the ICC World XI against the West Indies at Lord’s on Thursday. Alex Hales and Shahid Afridi are among 90 foreign players set to participate in the inaugural T20 Global League draft to be held this weekend. Legendary Pakistan all-rounder Shahid Afridi has retired from international cricket after a 21-year-career. On June 14 Shahid Afridi played his 500th List-A match when he turned out for Hampshire, adding another milestone to an illustrious career.